Fall 2015 featuring The Ddora Foundation in their donor profile. 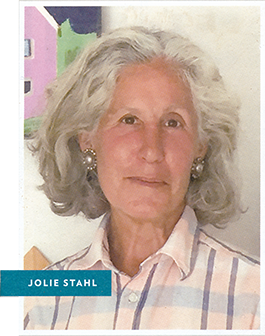 For artist and philantrhopist, Jolie Stahl, founder and President of the New York-based Ddora Foundation, North Bennet Street School aligns perfectly with the mission of her non-profit: to preserve the applied arts in America. Jolie founded the Ddora Foundation in 2007 to support the teaching and learning of traditional crafts such as woodworking, decorative arts and historic preservation. She admires how NBSS teaches and shares traditional American crafts and has supported the school since 2011, generously funding scholarships to help four students each year. This past year, a grant from the Ddora Foundation made it possible to bring Dr. Georgios Boudalis, a renowned Greek artist, bookbinder and scholar of Byzantine book structures, to NBSS as a visiting artisan. In addition to continuing her support for scholarships–always a critical need for NBSS students–Jolie hopes to bring more master craftsmen-in-residence to NBSS. Since NBSS moved into its new building, Jolie has become even more impressed with the school, its well-planned space and all of the equipment it houses. She describes it as an extraordinary, visually beautiful campus. “The fact that these very different crafts are housed in one building makes the school unique and compelling as an institution.” She knows of no other place like NBSS. Stahl is the co-author with her husband, anthropologist and author Robert Dannin, of Black Pilgrimage to Islam. The book is a comprehensive ethnographic study of African-American Muslims. The recent alumni survey also revealed that graduates have an overwhelmingly positive experience while students and are always looking for ways to stay engaged. The number one way we attract new students, even in this age of rapidly advancing technology, continues to be by workd of mouth and graduates are our best school ambassadors. One way for those who live far (and those who live near) to help the school and continue to stay engaged is by sharing your NBSS experience with someone interested in an education in craft. You know best what the school has to offer and how it can change a life! for information on how you can reach prospective students in your area.